First and foremost, a big THANK YOU to all of our 2017 attendees, vendors, performers, workshop leaders, volunteers and staff. Without all of you this event would not have been possible!!! 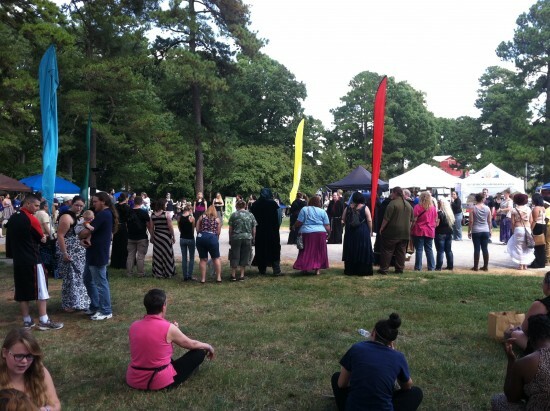 This year was the largest Central NC Pagan Pride Days Festival ever (and in a new venue to boot)!!! With over 6000 people in attendance, across both days, we were able to collect roughly $2000 in cash donations for our various charities and enough cash/food to provide 7500 meals for the Food Bank of Central and Eastern NC (enough to feed 40 families for a year). Also, the wonderful folks with the Wake County Animal Center found loving homes for 6 adorable kitties and both the American Wildlife Refuge and the WCAC were able to collect several charitable donations for their causes. On top of that, our raffles raised an additional $2,200(which we’re pretty sure is a new record), and the 2017 T-Shirts nearly sold out. To say this year was a huge success would be an understatement and none of it would be possible without our wonderful Pagan Pride Raleigh community!! When we work together we can move mountains!! Again, we thank everyone who made this year (and every year) possible!! We want to know what your experience has been with the 2014 event, and what suggestions you might have to make 2015 even better. If you did not attend Pagan Pride Raleigh 2014, feel free to complete the relevant parts of the surveyanyway, and maybe tell us why you didn't attend this year in your final comments.